Ways to utilize the healing properties of herbs in everyday cooking and eating. Syrups are made by mixing an herbal decoction with a sweetener. Syrups are used to add sweetness to an herbal remedy, making it easier to take your medicine or as a delicious topping for breakfast foods, desserts and ice cream. Using 2 oz. of herb(s) per 1 quart of water, heat in a pan over low heat. Simmer the liquid down by half. Strain the herbs and pour the liquid back into the pot. Now add your sweetener (honey, maple syrup, sugar, etc. I prefer honey as my sweetener) You want 2 parts liquid to 1 part sweetener. Warm over low and stir until well combined. Remove from heat and pour into a bottle. Store in refrigerator. This should last several weeks. Raw honey alone has many healing benefits but infuse some herbs into it and you now have a healing power house that is so yummy and easy to use. Start with 1 cup of raw honey. Warm over very low heat, just until it gets to where it can pour easily. In the summer I just place it outside for an hour or two. Make sure the temps do not get above 100 degrees. Place 1/4 cup of herbs (either powdered, dried or fresh wilted) in a pint jar. Pour the honey over the herbs and stir to combine. Let sit in a warm spot for 2 weeks. If using fresh herbs, they will raise to the top of the jar, you can scrape them out or leave them in. Use your honey to make an instant tea (1 Tbsp. honey to 1 cup of hot water), spread on toast, put in hot cereal or use in your cooking. The options are endless. In the book The Herbal Kitchen, there is an entire section on different combinations of herbal honey - so yummy. 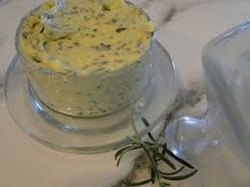 You can make a sweet or savory herbal butter following these simple instructions. *If using dried herbs cut the amount down to 1/4 cup. Mix, until well blended and store in fridge for up to three weeks or in the freezer for six months. Same instructions for savory butter. Here is a tutorial on how to make ghee. Add 3/4 cup fresh herbs to warm ghee and let sit for two weeks before using. Add 1/4 cup if using dried herbs. Grind or use powdered herbs to make special blends and combinations for all sorts of uses in the kitchen. The Herbal Kitchen has some great recipes for both sprinkles and salts. The easiest method for incorporating herbs is through our meals and drinks. I picked this book out at the library and used it so much I ended up buying it. There are 250 recipes and a lot of "Oh, I can use herbs for that" moments. This book contains many recipes in the following sections: Herbal waters, drinks, smoothies, honey, vinegar, cordials, oils, ghee, pesto, sprinkles and salt. 50 herbs are also highlighted at the beginning of the book and include more ideas on how to use those herbs.